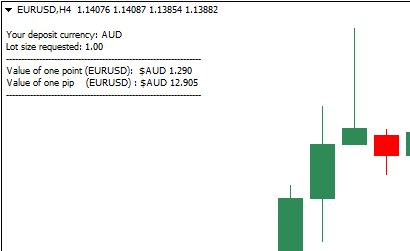 "How much is a 1 pip movement on EURUSD (or any pair) worth in my currency???" It's a question we see asked frequently on the MQL forums and other forex websites. Knowing how much a 1 pip or 1 point move on a currency is going to make you (or cost you) is one of the most important factors in any forex trade. If you don't know that, how can you calculate your risk to reward??!!?? This very simple calculator will tell you exactly what the value of a 1 pip or 1 point move in any pair will be in your base (deposit) currency. Either use the calculator "as is" for a handy tool, or use the formula inside for your own EA and money management strategies. The code is provided as open source, free to the MQL community to do with as you please. There is only one input required, the lot size you plan to trade. Simply enter that and everything else will be calculated for you automatically. Standard (4 digit) and ECN (5 digit) brokers are taken into account in the calculations. It's a hedging Expert Advisor, which trades only one time per day. Up/Down arrows drawn in chart window. The Expert Advisor closes all positions if equity exceeds specified percent from balance.